10-Jan-2017 Iceland Joins the Diaspora Tapestry Nations! Our Diaspora Tapestry began with a target of 25 Nations across the globe, and we ended with 34 including Antarctica and Tristan da Cunha, but not Iceland! It was a spectacular oversight not least because they defeated the auld enemy at soccer in the European Cup in 2016. However, as many will know Icelanders don't take No for an answer and resolved: [i] to hijack the tapestry as it travels back from Ottawa to Scotland end January and to stage a 3 week exhibition but also [ii] to create 5 panels for display in Iceland during February 2017. 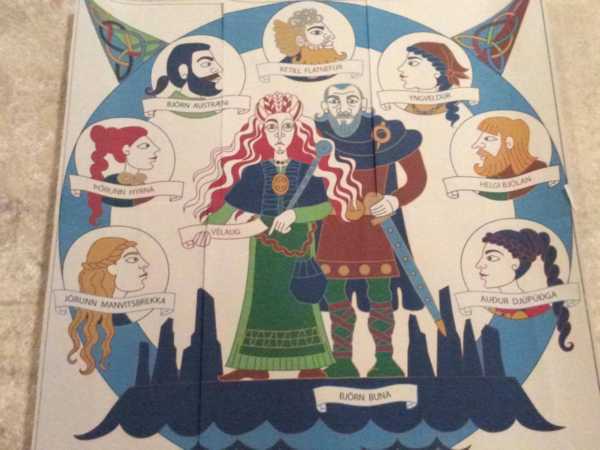 The five Icelandic panels tell the story of sisters Thorunn Hyrna and Audur the Deepminded, daughters of Ketill Flatnose, a Norwegian viking chief who raided and then settled with his family in the Hebrides around the middle of the 9th century. Several Icelandic medieval sagas, as well as Landnámabók / The Book of Settlements tell stories of this family, claiming that from the parents of Ketill Flatnose "almost all great men in Iceland are descended." Four of Ketill‘s five children were baptized while in Scotland, as well as some cousins who also came from the Hebrides and settled in Iceland. This strongly implies, along with a couple of Gaelic by-names, that they grew up there as Norwegians adhered to the Nordic religion of the gods and goddesses of Asgard till the late 10th century. Thorunn Hyrna was given in marriage to Helgi the Lean, son of Norwegian Eyvind and Rafarta (Rabhartach), daughter of Irish king Kjarval (Cearbhall). They left the Hebrides with a large family to settle in Iceland. Helgi is said to have been of the Christian faith but when at sea and in danger he would ask the hammer-wielding God Thor for help. Towards the end of the long voyage to Iceland he asked Thor where to land and was directed to a deep fjord in the north, called Eyjafjord (Islands‘ Firth), because of two islands there. After the first winter they decided to settle in a different place in the firth and had to cross the large Eyjafjord River. 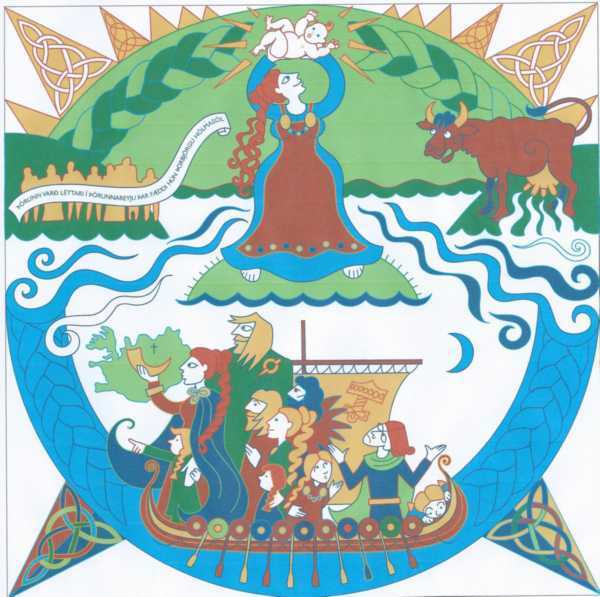 Thorunn Hyrna was pregnant with her eighth child at the time and in a holm in the river she gave birth to a daughter, Thorbjorg Holmasol (Thorbjorg the Sun of the Holm). This story can be seen as a way of telling us that she consecrated the land for herself and her children, giving birth at a holm in the mouth of a river. Audur the Deepminded was married to Olaf the White, the first Viking King of Dublin. Their son, and only child, was Thorsteinn the Red who married Thurid, sister to Helgi the Lean. The sagas tell us that Thorsteinn was a great warrior and that after his father's death in battle he allied himself with Sigurd the Great, Earl of the Orkneys. He then harried Scotland far and wide, laying claim to Caithness, Sutherland, Ross and Moray as his kingdom. Eventually, he made peace with the Scots but was betrayed by them and killed in Battle in Caithness. Audur was in Caithness when she heard about her son‘s death. Laxdæla Saga (The Saga of the People of Laxdale) tells us that then she “deemed she would have no prosperity in store there. So she had a ship built secretly in a wood, and when it was ready she arrayed it, and had great wealth withal; and she took with her all her kinsfolk who were left alive; and men deem that scarce may an example be found that any woman has ever got out of such a state of war with so much wealth and such a large retinue. From this it may be seen what a great paragon of women she was." Audur went first to the Orkneys, where she married off Thorsteinn‘s daughter Gróa to Dungað (Donnchadh) “earl of Caithness“, probably the same man who gave his name to Duncansby in Caithness. In Orkney, she bought from Sigurd, Earl of Orkney, the widow of the Scottish chief Meldún (Máel-Dúin), named Myrgjol (Muirgeal), daughter of Irish king Gljomal (Gleomál) and her son, Erp. Sigurd had enslaved Myrgjol after killing her husband in battle. From the Orkneys she went to the Fareo Islands, where a second granddaughter, Ólof, was married off. Then she sailed off for Iceland and was shipwrecked on the south coast, but “all were saved, both people and goods“. After a long travel Audur finally settled in the west of Iceland, claiming for herself and her people Dalir or Dales, in Breidafjord. She gave freedom and land to her Scottish slaves and the names of some are still to this day retained in the place-names there, such as Dale of Hundi (the name means “dog“, perhaps from Gaelic Cú), Dale of Sokkolf, Dale of Vífill and Erpsstadir (Erp´s Farmstead). Other Gaelic-sounding place-names also exist in the Dales, e.g. Kýrunnarstadir (orig. Kirina‘s Stead), Dunkur (perhaps Donnchadh‘s Farmstead) and Dönustadir (perhaps Farmstead of Danu).